For economical MIG welding using CO2 gas, these regulators will fit 'Pub' type gas cylinders, as well as other types of UK standard CO2 cylinders with an external thread cylinder valve. Solid brass construction with twin gauges, one showing the pressure inside the cylinder, and the second showing output pressure calibrated in LPM (Litres Per Minute) for an accurate flow setting. 300 Bar rated for service at increased gas cylinder pressures, so fully compliant with the latest gas cylinder regulations; the gas hose outlet is standard 3/8 inch BSP right hand thread. Cylinder gases are stored under ever increasing high pressures and can be extremely dangerous, so the regulator needs to be up to the job. Some of the cheap, imported gas regulators on the market have been shown to fail catastrophically in laboratory safety tests. 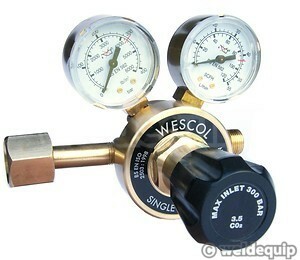 WESCOL have been manufacturing gas regulators in the UK for over half a century. These regulators meet all international safety standards, and are proven the world over. The regulator described above together with the hose and fittings required to connect to the small plastic gas tube found on hobby MIG welders. Argon mix gas will give you the very best welding performance on Mild Steel, and is also suitable for Stainless Steel.